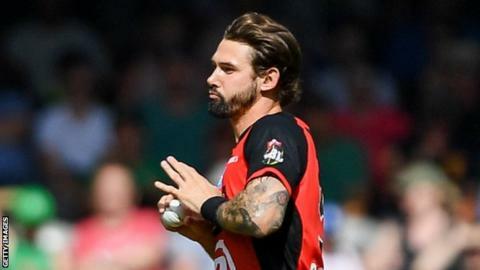 Derbyshire have signed Australia fast bowler Kane Richardson for their 2019 T20 Blast campaign. The 28-year-old, who won the Big Bash with the Melbourne Renegades last month, will be available for the entire tournament in England. He was the leading wicket-taker in the Big Bash, with 24 at an average of 17.70 and a strike rate of 13.70. He has also appeared in three Indian Premier League campaigns and played 27 limited-overs internationals. "Kane is a top-level T20 bowler and that is what we were looking for with our second overseas signing," Derbyshire's T20 Blast head coach Dominic Cork told the club website. "He's just won the BBL, which is one of the most competitive tournaments in the game, and I've been impressed by what I've seen. "He's quick and with his international experience I'm looking forward to seeing him lead the line for Derbyshire."